It’s always nice when something you plan works out well, and I’m pleased with the limestone bank we built in the garden last year. The inspiration for it came from Jan Miller-Klein’s book “Gardening for butterflies, bees and other beneficial insects” (http://www.7wells.co.uk/index.asp). In it, she recounts how she created what she termed a “moraine garden” in order to introduce the sort of poor quality, alkaline conditions that some wild flowers need. We have difficulty doing much with one side of our garden, as it was a rubble roadway for lorries for some 30 years, and when the land was sold back to our property, it seems all the did was shove down a bit of topsoil over it, meaning that strip is topped by a mixture of soil and (lots of) rubble, under which is compacted subsoil. Most things planted there tend to go a very funny colour, I guess because some nutrients are locked up by the compactions, and refuse to grow for a couple of years, after which they either get going or expire. We started making the bank by putting down a membrane, to discourage the bindweed, though I had some concerns that it might stop some of the plants putting their roots down deeply enough: a problem which doesn’t seem to be occurring. On top of that we put whatever rubble we could lay our hands on, including some dug out of the garden and a contribution of broken tiles from next door. We then bought some limestone chips and some limestone “dust” to make the top layer. One thing we rapidly learnt was that fine limestone, once wetted, sets very hard! Planting the wild flowers I grew from seed in the greenhouse was an interesting experience: I’ve never had to use a hammer and chisel to plant something before! I’ve so far planted kidney vetch, harebells, bladder campion, bird’s-foot trefoil, rock rose, black medick and (recently) field scabious. None of them had any more nutrients on planting than the soil they were grown in, but they are all flourishing. They are getting a bit too rampant in places, actually, which is amazing. Limestone bank in flower. Yellow in foreground is kidney vetch, while the yellow behind it is bird’s-foot trefoil. The white is bladder campion, and in the foreground you can just see the blue of a harebell. 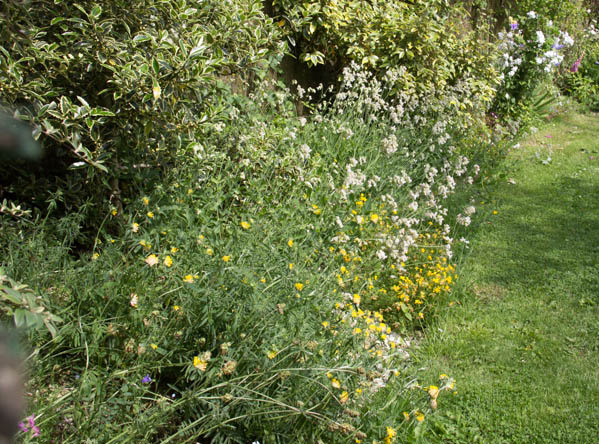 My reason for creating the bank was to make use of a difficult area, allowing me to grow some of the limestone-loving wild flowers I think are very attractive. 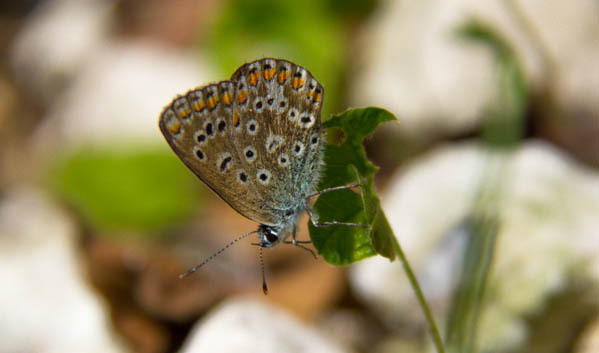 There was always the vague hope that a butterfly or two would be attracted: most of the Blues like plants like this. Most Blues would not be found in a garden, but the Common Blue was always a possibility, and one male actually turned up yesterday and found the bank. Whether a female will find it and lay eggs is considerably more dubious, not least because these butterflies don’t just need certain plants, they need ants as well, with which they have a symbiotic relationship: the caterpillars produce a sweet liquid which attracts the ants, and the ants provide some protection to the caterpillar in return (with some species the ants even take the caterpillar into their nest, where it eats the ant grubs!). I have seen black ants on my limestone bank, but goodness knows if they are the right ants. So, the bank has done its job and allowed me to grow some attractive flowers and they have attracted a Common Blue. Whether I’ll ever get them breeding remains to be seen, but it’s fun to hope. It is very possible I’ll get some moths using the plants for their caterpillars – my challenge will be in spotting them. I don’t know why the common bird’s foot trefoil (lotus corniculatus) is not grown more in gardens. It is a native British plant, found in chalk and limestone habitats in the wild. It has pretty yellow flowers, that are reddish in bud, and when it sets seed, the parts of the seed heads spread out in different directions, like the claws on a bird’s foot – hence its name. It only grows a few inches tall, but can spread over quite an area. Its flowering period is not as good as, say, lobelia, but it does flower for some weeks, and will come back year after year. You can even grow it in grass and mow it, and as long as you don’t completely scalp it, it will keep coming back. Bird’s-foot trefoil along the front of the greenhouse, and close-up with a bee. I’ve got it in grass, in the corners of the patio steps (self seeded) and have grown it both as a border plant and in a hanging basket – the last is good because you can get a really up-close look at the flowers. You can see in the photo on the left above, taken in August 2006, that this was a very dry and hot period and the grass is looking very sorry for itself, but the bird’s-foot trefoil is still blooming away. Although it comes from chalky habitats, it will grow in most soils unless they are very acidic, and as long as they aren’t too fertile, when it can get overwhelmed by other vegetation. 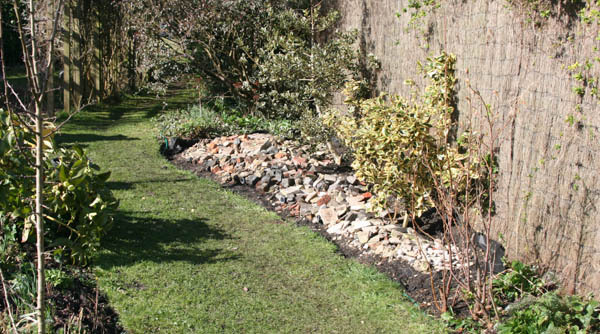 It will do well in poor, infertile places where a lot of plants will struggle – the sunny edge of a gravel path, for example. It is a very important butterfly plant, serving as the caterpillar food plant of several butterflies and many moths, and as a nectar source for more. In practice, in gardens, the most likely species to use it are the Common Blue and the Five or Six-spot Burnet moth. It is so easy not to know that you have caterpillars on a low plant – I only found the ones in the greenhouse border above were host to some when I got right up close to chop the grass back. I’ll leave you with two colourful photos to brighten things up a bit in this depressing and dull weather. You won’t get these butterflies in your garden, and they aren’t my photos, but I can’t resist sharing a couple of shots of butterflies on bird’s-foot trefoil by the amazing photographer Ken Dolbear with you. 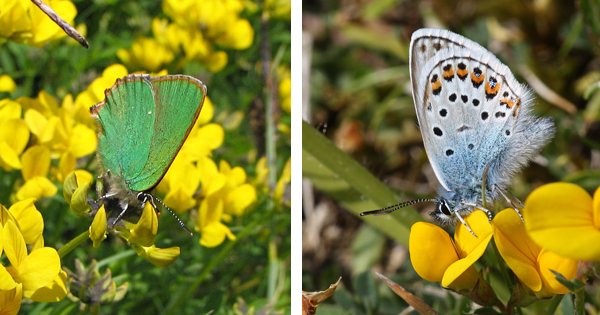 Left: Green Hairstreak. Right: Silver-studded Blue. Both on bird’s-foot trefoil.